1974 was Surtees' worst GP season since Fearless John entered F1 with his self-styled and Peter Connew-penned TS7. The previous year had been poor in its own right, Mike Hailwood and Carlos Pace going through hard times with the unreliable and accident-prone TS14A. Still it was heaven compared to what the team had to endure in 1974. The new car, TS16, was introduced amidst much optimism. It had pleasing looks, following TS14 lines, but had a smarter radiator lay-out. On the downside it was still overweight, just as TS14, which was not a good sign for Carlos Pace and Jochen Mass's 1974 chances. Then most of Surtees' sponsorship deals fell through and the team were forced into running a shoestring effort during the first two races of the season. Then, fortunately, from South Africa on, Surtees managed to strike a modest deal with Danish electronics company Bang & Olufsen, with Pace immediately throwing coins in the new-found money well (about to become a money pit…) by scorching to an amazing second on the grid at Kyalami. Sadly, he could not follow that through into the race and finished 11th, one lap down. After that, the car's performance didn't improve as fast as that of their rivals, Pace and Mass's efforts reduced to back-of-the-grid struggles come the Swedish GP at Anderstorp. There, frustrated by the car's poor handling, Carlos quit the team during practice. Similarly, second driver Mass had endured all sorts of niggling problems, a lack of suspension parts forcing him to withdraw from the Monaco GP obviously the most embarrassing one. After his home race Mass - along with sponsor B&O - decided to leave the team, to be taken on as a third driver for the two North American season-closing events, a prelude to Jochen's signing for a full-time seat for 1975. So, halfway through the season Surtees had lost both his young talents, and money was still short. In France, he put his inexperienced F2 regular José Dolhem in the car vacated by Pace but the Frenchman drowned in qualifying for his home event. Then, beginning at Brands, Derek Bell made a return to an F1 cockpit, joining up with the same team that gave him his only World Championship point when he took sixth in a one-off for Surtees at the 1970 US GP. Bell's talent did more to highlight the shortcomings of the TS16, Derek's final association with Big John's team proving strikingly fruitless, the Englishman qualifying just once, for the event in our picture. Unsurprisingly, this was at a true "driver's circuit", the Nürburgring. Meanwhile, Jean-Pierre Jabouille was given his first run in Austria. The season then not only ended in shame but in tragedy as well. At Monza, Dolhem again filled in, this time for the departed Mass, before Surtees took a gamble with the young Helmuth Koinigg, who had just one failed attempt at qualifying for a World Championship Grand Prix under his belt: going slowest for the obscure Finotto Brabham team at the Austrian GP. For the season-closer at Watkins Glen, Bell was ousted in favour of the Austrian who had actually done well to qualify during his first time with the team at Mosport Park. With Koinigg and Dolhem on board for the US GP, now inexperience on the driving front was at its zenith. Koinigg again did well to get into the race 23rd, but during the race the Watkins Glen track brought tragedy for the second consecutive year, poor Helmuth's Surtees inexpicably leaving the track at high speed. The car crushed the Armco on impact and the young Austrian was killed instantly. Surtees then proceeded to withdraw its remaining driver from the race, which would be the last time Dolhem was seen in Grand Prix racing. The same also applied to Derek Bell MBE. But the man from Middlesex at least had one thing to fall back on: something what was to become one of history's most successful sportscar careers. As is the case with Dickie Attwood, Derek Bell's Grand Prix record has a somewhat ragged and topsy-turvy look to it - subbing here, doing a part-season there, skipping another. In between, both were busy perfecting the art of sportscar driving. Whereas Attwood was certainly one of Britain's finest sportscar drivers of the sixties, Derek Bell must surely be one of the best of the seventies and perhaps even the best of the eighties, by then putting his wealth of experience to extremely good use. 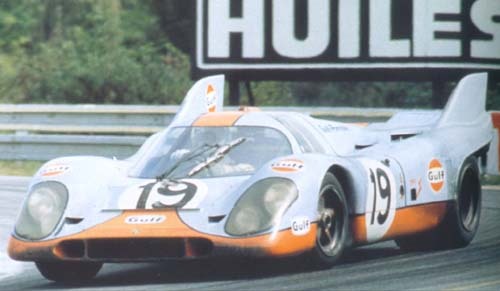 Attwood and Bell were team-mates during Dickie's final season in professional racing and Derek's first year with John Wyer's team, giving Attwood (here sharing the 917K with Hermann Müller at Le Mans) the opportunity to hand over the mantle of top British sportscar driver to Bell, so to speak. Both Britons sharing a 917 with BRM boys Rodriguez and Siffert, 1971 was a classic Gulf Porsche season. The year before, with the aid of Tom Wheatcroft, besides finishing a fine runner-up to Regazzoni's Tecno in the Euro F2 title race, Bell's entry into the realm of sportscar greats came with a fiery baptism. Invited by Ecurie Francorchamps boss Jacques Swaters to drive the Belgian's Ferrari 512 at the Spa 1000kms, he became involved in a horrendous pitlane fire, but this did not scare him off replacing Brian Redman as Jo Siffert's team-mate in the crack John Wyer Porsche, the pair helping to deliver another sportscar title to the marque. They got off on the right foot by taking the tragic opening race at Buenos Aires, before taking third Brands and second at Monza and Spa. At the final event at Watkins Glen, Gijs van Lennep teamed up with Siffert, while Bell was joined by the departing Richard Attwood. The two pairings took second and third places behind the Alfa of Peterson and De Adamich. Bell stuck with the Gulf superteam while his few Grand Prix outings brought him nothing but misery, stepping in mid-season at Tecno proving to be the most prominent disaster, although in 1972 his Gulf team, now equipped with the new Mirage-Cosworth, was thoroughly eclipsed by the works Ferraris of Andretti, Peterson, Ickx, Redman, Merzario and Schenken (what a line-up!). In 1973, Bell formed a new driver combination with Mike Hailwood, having secured the team's best 1972 result with third at the season-closer at Watkins Glen, sharing with Carlos Pace. This proved to be another tough year for the Gulf team, most of the spoils shared by Ferrari, Matra-Simca and, on occasion, Porsche, in one of the best and closest fought Makes Championships. Bell and Hailwood did however manage to take the Spa 1000kms, the Mirage squad even taking the double with the sister car of Schuppan and Ganley in second, trouncing the Pescarolo/Larrousse Matra in third. The following year saw the Mirage team edging closer to the faster Matras, which now faced its stiffest competition from Alfa Romeo, Ferrari having left the sportscar series to successfully concentrate on Formula One. Initially paired with Hailwood, Derek took second at Spa, before joining Ferrari refugee Ickx to take third at Paul Ricard. For the final two races of the season, Bell joined up with David Hobbs to take two third places at Brands and Kyalami. In 1975, his GP career now over, he really started to blossom as a sportscar driver, taking the Gulf Mirage GR8 to his first of five Le Mans wins (sharing with Ickx), while he and Pescarolo formed a formidable pairing in Alfa Romeo's successful assault on the World Championship of Makes, taking their T33 to three big wins at Spa (obviously one of Derek's favourite tracks), the Österreichring and Watkins Glen - another track at which Bell always seemed to excel. For 1976, Alfa Romeo and Alpine-Renault withdrew from the sportscar championship, which from then on would turn into a Group 5 Porsche 935 benefit, so Derek made a surprise switch to big Group 2 touring cars, signing for Ralph Broad's Broadspeed Jaguar squad. After an inauspicious end-of-season debut, together with Tim Schenken, a full two-car European Touring Car Championship attack was launched to beat the almighty BMW 3.0 CSLs, Derek sharing with touring car ace Andy Rouse. Unfortunately, Broad's team got off on the wrong foot in the first place, being forced to use the stubby XJ12 body as their racing platform instead of the sleek new XJS, which wasn't suitable for homologation - courtesy of Jaguar management's hair-brained understanding of motorsports. Broadspeed did all it could to turn the XJ12 into a winning machine - it sure looked forceful and produced a great sound - but its reliability was dreadful compared to the Alpinas, which routinely lasted to the finish while the Jags were left pondering their string of DNFs. At the end of the season the Broadspeed challenge was unsurprisingly withdrawn. The experience left Bell traveling the world for drives in a great variety of championships, Derek even taking up single-seaters again as he made forays into F5000 and F Atlantic. Then the moribund World Championship of Makes, by then the playground of minor constructors such as Rondeau, Chevron, Osella, De Cadenet and a host of privateer Porsches, was revitalised into the new World Endurance Championship, with Group 6 and later the glorious new Group C rules attracting the finest sportscar manufacturers in the world - from Porsche to Lancia, from Jaguar to Sauber. 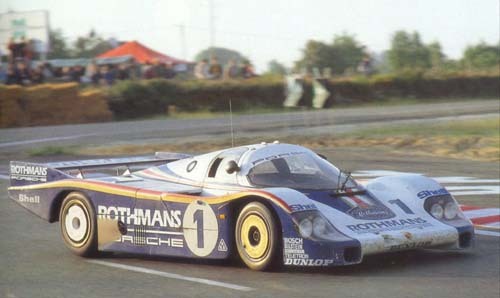 It spelled a return to top form for Bell, who grabbed the opportunity to sign for the works Rothmans Porsche squad, initially joining up with Jacky Ickx, Vern Schuppan and Stefan Bellof (helping the young German to his 1984 title), and then forming a driver pairing with Hans Stuck, the two taking the newly formed sportscar driver's championship (in effect since 1981) in both 1985 and 1986. That last important title got him an MBE. In the nineties Derek consigned himself to irregular drives and of course Le Mans. It took him six more years to grab his second win at the Sarthe in 1981, again with Ickx, now driving the open-top 936, the original Alpine beater in its final year of service before handing over its duties to the all-new Rothmans Porsche 956. In its first season, Bell and Ickx again won Le Mans and claimed second in 1983. He took his fourth Le Mans in his 1986 glory year, now in the 962C derivative, along with Stuck and Al Holbert, and did it again in 1987, sharing with the same guys. 1988 brought a runner-up spot to Big Cat drivers Lammers, Wallace and Dumfries, the Porsche hegemony surrendering to onslaughts from Jaguar, Sauber-Mercedes, the surprise Mazda rotary car and finally Peugeot before the Group C era came to a close. Ironically, the 1994 classic was won by a heavily revised Dauer 962C, while Bell drove another 962 spin-off, the Kremer K8, to sixth, sharing with Robin Donovan and Jürgen Lässig. After the race Derek announced that this had been his last Le Mans. Yet the following year he returned in a Harrods McLaren F1-GTR, co-driven by his elder son Justin and Andy Wallace. They finished a splendid third, and suddenly all the talk of retirement had disappeared. In 1996, Olivier Grouillard took the place of Justin Bell and the trio romped to sixth after 24 hours. And that was finally it. Derek Bell's sportscar palmares is still a fascinating read, as the Briton will always remain one of the best sportscar drivers ever. Yet he could have been a great Grand Prix driver - so it seems rather ironic that Bell is one of ESPN's F1 commentators right now. By the looks of his largely underfunded rise to single-seater stardom during the later part of the sixties, he could have gone all the way. In Formula 3 he was run by the small Church Farm Racing, the team run by his stepfather "Colonel Hender", that later was to support Peter Gethin's successful assault on the inaugural European F5000 title. He then joined up with Peter Westbury, which proved to be a wise move, as the experienced hillclimber and F2 racer refined his race craft to good effect. Back with his stepfather, they bought a Brabham BT23 to take on F2 and it wasn't for long that he attracted the attention of none other than Enzo Ferrari, who put him in his works F2 team. He debuted for the reds in the Lotteria GP at Monza, where he found himself in the middle of a huge pile-up. Then he shone at Zandvoort, looking set to win until his gearbox failed. It was enough for the Old Man to give Derek his F1 break that very same season, in a third Ferrari 312/68 alongside regulars Ickx and Amon. He did extremely well to qualify 8th for his debut race, just half a second shy of his team leaders, but in the race his car lasted but four laps, its fuel system giving the ghost. In the US came his next opportunity after Jacky Ickx seriously hurt himself at Mont-Tremblant. On a track he hadn't seen before Derek was less equipped to stay with the leaders, qualifying nearly three seconds slower than Amon, retiring in the race with a blown engine. The uninitiated might easily be forgiven for thinking Bell was not much of a driver based on his F1 record. 9 starts and 6 DNQs spread over 7 years, and only a single point, lead you to that conclusion. Yet the uninitiated would be wrong, for Bell was one of the great sports car drivers and for him F1 was more of a sideline than a career. His misfortune was to be in the wrong place at the wrong time. After rising to prominence in F2 in 1968 he won a Ferrari F1 contract, retiring from both his races in Italy and the USA. He might have expected better in 1969 but Ferrari withdrew from most of their planned racing leaving him without a drive. His only F1 outing that year would be in the McLaren 4WD car, which would prove no more effective than any other 4WD effort. In 1970 Bell would finish runner up to Regazzoni in the F2 Championship and take his only F1 World Championship point in his singleton race for Surtees that year in America, but it would also be significant as the year of his first sports car entry in the Spa 1000km. The following year, paired with Jo Siffert, Bell would win the sports car world title in the Gulf/John Wyer Porsche, which he would campaign with great success over the following years. 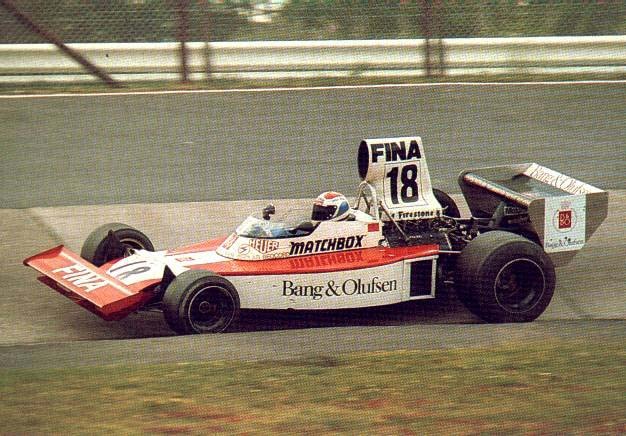 His F1 appearances with the Tecno in 1972 were best forgotten, and of his 5 outings with Surtees in 1974 he would qualify only once at the Nurburgring, finishing 11th. He was dropped for Dolhem in the last race that year and never raced F1 again. Nevertheless, the first of five Le Mans 24hrs victories came in 1975 and Bell would continue to drive a varied selection of disciplines over the following seasons. He would win back-to-back sports car championships in the Porsche in 1985 and 1986 while paired with Hans Stuck, and despite being well into his fifties continued in sports cars and IMSA racing until the late nineties.